Up for grabs today is a package of 6 unmounted stamps from High Hopes Rubber Stamps...TIMES 2!! Yep, there will be 2 winners for these comments. I was going through my stamps, adn noticed a few repeats, so I am giving them to you! I have had people asking if these prizes are donated - NOPE! I am giving them away from MY stash, no store has given anything, just me, so take advantage of it, there is more to come...hehehe! On this post, I want you to tell me how many of my TUTORIALS you have completed, and which is your favorite! The draw for this will be on Tuesday, have fun and happy stamping!! I got this awesome RAK from Chrissy awhile ago, and HAD to show it to you! Is that not the best coloring you have ever seen ? I love how you can see the ripples effects on the ears, and the highlights with the great shadowing. Chrissy is the stamp designer over at High Hopes Stamps, and if you think she makes great stamps, you should see her paintings - WOWZA!! Besides being a talented artist, she is one of the sweetest people I have ever had a chance to meet in cyberspace! Thanks Chrissy, I absolutely LOVE it! It is soon time to send the eldest child of my bosom to school - WOOHOO! I decided to make the teacher a thank you gift...hehehe. Seriously, I am excited for him to go to school, but I am going to miss him. How cool is this? I found a wooden open top box at my local $1 store and thought it would make a great pencil holder. I bought some red acrylic paint, painted it up, and then let it dry overnight. I went to a LSS (Yesterday's Memories for those in Saskatoon), and picked up some undressed Basic Grey chipboard letters. Bonus for me, is that they were self adhesive!! I came home, and took out the "a". I laid it on scrap paper and proceeded to smoosh (technical term) my stazon black ink onto it. I used my black Sharpie to go along the edges, and stamped on it with white craft ink. I wanted it have a chalkboard effect. It was the School Background from High Hopes. I took the Big Ol' Backgrounds Stripes from All That Scraps, and inked it up with ballet blue. I stamped it on white CS, and added the vertical strip with my pixie pink SU marker. It isn't exactly perfect paper, but it sure is close! I then stamped the High Hopes BG again on it in sahara sand, to look like doodles, and then wrote the word apple. I punched the edge with my spiral punch (SU), and then tore and crumpled it up. Little idea for ya . I didn't have an acrylic block big enough for my BG stamp, so I used a Cuttlebug plate. Everything except the "a" was added with the red-line dimensionals that I got from Jody. I tore the "leaves", and cut hand cut the "stem". I added veins with my bone folder, so they would look more realistic. I hope this makes up for my post yesterday!! I think it turned out really cute, and it is also useful. So when everyone brings an apple to the teacher on the first day, this is one she can keep. Have fun and happy stamping!! P.S. - Yes, Marg, you are getting one too...hehehe. Pirates Who Don't Do Anything ! It was cool that High Hopes had just released a whole bunch of pirate stamps. I used the treasure chest and the ships wheel for mine, stamping them with black stazon and coloring them with sharpies. If you want to make one at home it is so simple. Just take a 3 inch wide piece of scrap material big enough to tie around their head, and let them decorate it with sharpies, or fabric markers (or stamps). Take some leather cording, string some beads on it and tie it all together. They love it. Have fun and happy stamping!! Anyone who does not like receiving new stamps, raise your hand ! OK, those that lifted their hand off the mouse, don't read any further. Because High Hopes Rubber Stamps just had a HUGE release this month!! There are 9 - yes NINE - web pages of new images in the HOTP section. If you click on the keyword, it will take you right to them. I am using 3 different ones on this card - the Treasure Map, On Guard Oberto, and the sentiment. I stamped the map on very vanilla CS with creamy caramel ink. I spritzed the BACK of it with water, to moisten the CS. Then, I crumpled it all up, and tore the edges. Before I flattened it out, I drug my caramel ink pad across the creases to age it, and then used a sponge and the same ink to distress it a bit more. That wasn't enough for me, so I used my cutter kit *love that little tool* to make the edges more torn. I wanted it to look like it had been used for many years, by many pirates. I then used my ruby red marker to color in the X. Then it was then glued onto a base of Night of Navy and some K & Co. DP. I didn't flatten it right to the card, and though you can't tell in the picture, it is all bumpy and looks like it is spread on a table or rock. Am I going to far with this theme...LOL? I stamped the sentiment in the top corner, and I stamped the pirate on white CS, colored him with my SU markers and cut him out. He was added to the card with dimensionals, and I noticed that there was a bare spot, so I put a jumbo eyelet through navy CS that had been punched with my large oval. I glued it down, adding the faux stitching with my white gel pen. I added some in the opposing corner to balance it off, and it was done! Just for those that had emailed my, this card is now up and the stamps are %25 off. So what are you waiting for, go shop, and then get ready to stamp!! High Hopes Stamps Winner !! thanks for your email on these stamps. i had never heard of them before and really enjoyed checking out the website. i have favorited it and am looking forward to checking them out further. i am interested in nature stamps/cards but i do enjoy all your cards very much. you do a terrific job making them and i do love your commentaries that go with them. So Rose Svendson, get me your snail mail address, so I can send you these stamps !! There are new Project Of The Month stamps at High Hopes for July. I made a card using all of them for you to take a look at. I made my own DP from the Leaf Bckground stamp, stamping it on more mustard CS. I colored in some of the leaves with a sponge and also sponged the edges in chocolate. I stamped Wagon Full Of Blessings and colored it in with my SU markers, accenting with the white gel pen. I matted it on really rust, and then on the card, adding stiches with my chocolate. I stamped the cute oak, maple and elm leaves, colored, cut, and glued them to the card. Finally, I stamped the sentiment, matted it on olive CS and adhered it to the card with dimensionals. Remember to make sure you are in the draw for some FREE high hopes stamps from me. Have fun and happy stamping!! High Hopes Sneak Peek and I'm Payin' It Forward! I hope this peaks your interest (pun intended), and gets you ready for some awesome new stamps from High Hopes! You will want to leave a comment on this post!! I am going to be drawing for some High Hopes stamps to send your way! One comment only, per person, and let me know what you would like to see in some images! I will draw on Thursday for them, but keep checking back for some cards. I am hoping to go to Hawaii next winter. I absolutely LOVE Hawaii. One of the best friendships I ever discovered was made while at school there. I went to University of the Nations in Kailua-Kona, HI on the big island. Since I went for school, though, I now want to go for a holiday. Everyone thinks that school there was like a vacation. Umm, hello, those two words don't even belong in the same sentence unless it is to say "School's out, time for vacation!!" When I go, I want to send postcards, not to say that I wish they were there, but to say na na na na boo boo - I'M JUST KIDDING!! Wouldn't it be cool, though, to make your own? I made a postcard, that is actually a card, so you would need an envelope. The images are from High Hopes stamps, and they are the Aloha sentiment, the Jungle Background, and Leilani. Everything was stamped with black ink on white, and colored with my Stampin' Up! markers. I then used a scrap scallop circle and a sponge to make the cloudy sky. I cut the little hula dancer out and popped her up with dimensionals in the scene. I think it would be a cute way to send some vacation. Have fun and happy stamping!! Here is the card I made for my Mom for Mother's Day. I really fell in love with a card that Megan did, and had to make one. I honestly don't like CASEing exactly, but you also can't really change much when you think the card is perfect! I did make some changes to work with the image that I wanted to use - Sunflowers from High Hopes stamps and the sentiment for there also. I used mellow moss for the base, and added some layers of sahara sand and white. I stamped the sentiment on it with sahara. 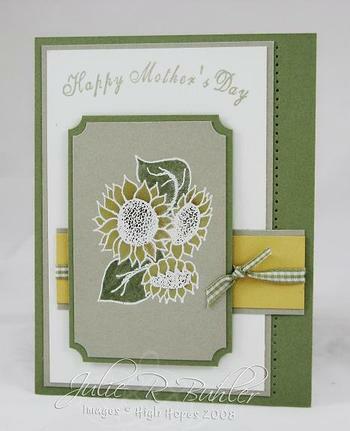 I embossed the sunflowers using white ink and white embossing powder on sahara CS. I then used my markers (so saffron, mellow moss, close to cocoa) to color in the sunflowers. I really like how it has a vintage feel to it. I used my ticket corner punch on the sahara and then the moss mat. I took a strip of sahara and saffron CS and tied on the moss gingham. This was added to the card, and then the image panel was attached with dimensionals. Finally, I added the paper piercing by the one layer. She really loved it!! I have gotten quite a few emails about the DVD tins. Of those wanting it to go to Australia, I am willing to do that, if you want to pay the shipping. Also, for those that want more than one, I am will only charge you true shipping costs, plus anything for packaging that I have to buy. You will not be charged the other amount times how many you get! I will try to email everyone today or tomorrow, that has emailed me. It won't be this morning, considering my MIL is moving today, and I offered to make supper for the whole family. I am so excited that so many of you really liked and I am glad that I can share it with you! Have fun and happy stamping! !